paint my ear drum! I couldn’t afford a real model so you’ll have to look at my mug wearing the recently arrived breathable air supply mask. The mask is hooked up to a 50′ hose which is connected to a small compressor. The compressor produces breathable air which is pumped to the mask. 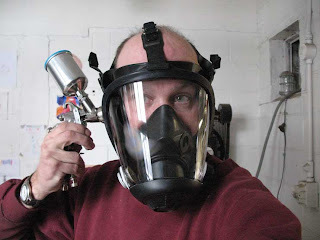 A useful safety piece of equipment because painting is a nasty bit of business. This breathable air system is one of the last pieces missing to my paint booth set up. I should be ready to spray soon! Now the real learning can begin. 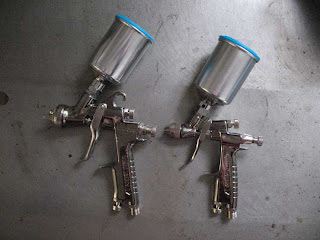 The second picture is of two of my spray guns. The larger one is an Iwata LPH-300 and the smaller one is an Iwata LPH-80. They are expensive but worth it.